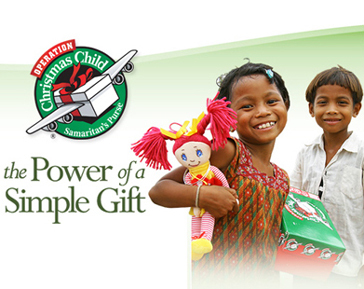 Help Pender share the love of Christ throughout the world by participating in Operation Christmas Child this year! Collect items to pack shoe boxes (small toys, school supplies, hygiene items, t-shirts, socks, accessories, & $7 for shipping) and place in the Christmas box near the coat racks by Nov. 15th. Pack a shoe box or two with your family or small group. (Instructions are located in the church lobby.) Filled boxes are due to Pender on Nov. 22nd. Pray that God will direct each person packing shoe boxes to put in just the right items for the child who will receive the box. Pray also that the children will receive Christ as their best gift. Donations for shipping are needed as each box costs $7 to ship. Checks should be made out to Pender UMC, with OCC in the memo. Donations may also be made online by clicking on this link. Help receive packed shoe boxes from the community between Nov.16th-23rd by volunteering for one or more slots. Training will be provided. Positions include greeting visitors and unloading and packing up shoe boxes. Sign up to help by clicking on this link.